Need a Wall Bed solution, but your room’s height limitation is a problem. The Alexa full wall bed is your ideal solution! It’s a great piece of furniture and a full bed that comfortably sleeps two. Designed in a "landscape" or "sideways" orientation, the wall bed works perfectly where vertical space is a limitation, but also in ultra small rooms and nooks that otherwise go completely unused. The transitional style of the Alexa will integrate with multiple types of décor. Assembly is incredibly easy and straight forward. The Euro slats take the place of a traditional box spring and make for a super comfortable night’s sleep. The bed folds away neatly and looks like stylish cabinetry, leaving you all that extra room plus a wide top surface for decorations. The Alexa can be fitted with our unique TV mounting platform or desk option. Transform your living space and make the day and night difference to your living space. Note: Ceiling height must be a minimum of 62” to install Dimensions: Bed (closed): 80 3/4”L x 16 1/2”D x 60 3/4”H Weight: 289 lbs Bed when opened will require a clearance of 62” from the wall extending into the room Bed includes all panels, Euro slat frame, four hydraulic piston mechanism and steel “engine block." This item cannot ship to APO/FPO addresses. Please accept our apologies. Transform your living space from day to night with the amazing easy to install, patent pending, beautiful Alexa Queen Portrait Wall Bed. The transitional style of the Alexa Queen Portrait Wall Bed will integrate with multiple types of décor. Assembly is incredibly easy and straight forward. The Euro slats take the place of a traditional box spring and make for a super comfortable night’s sleep. The Alexa Queen Portrait Wall Bed will accentuate any room that you chose to place it in. Using minimal tools and with incredible ease, this entire bed can be assembled in a couple of hours. The Alexa can be fitted with our unique TV mounting platform or desk option. Note: Ceiling height must be a minimum of 88” to install. Dimensions: Bed (closed): 64 1/2”L x 16 1/2”D x 86 3/4”H Weight: 315 lbs Bed when opened will require a clearance of 92” from the wall extending into the room Bed includes all panels, Euro slat frame, four hydraulic piston mechanism and steel “engine block." This item cannot ship to APO/FPO addresses. Please accept our apologies. This simple, yet contemporary silver twin-over-workstation bunk bed conveys chic style with clean lines and finish. A sturdy, steel-crafted frame with a powder coated finish promises stability and function. 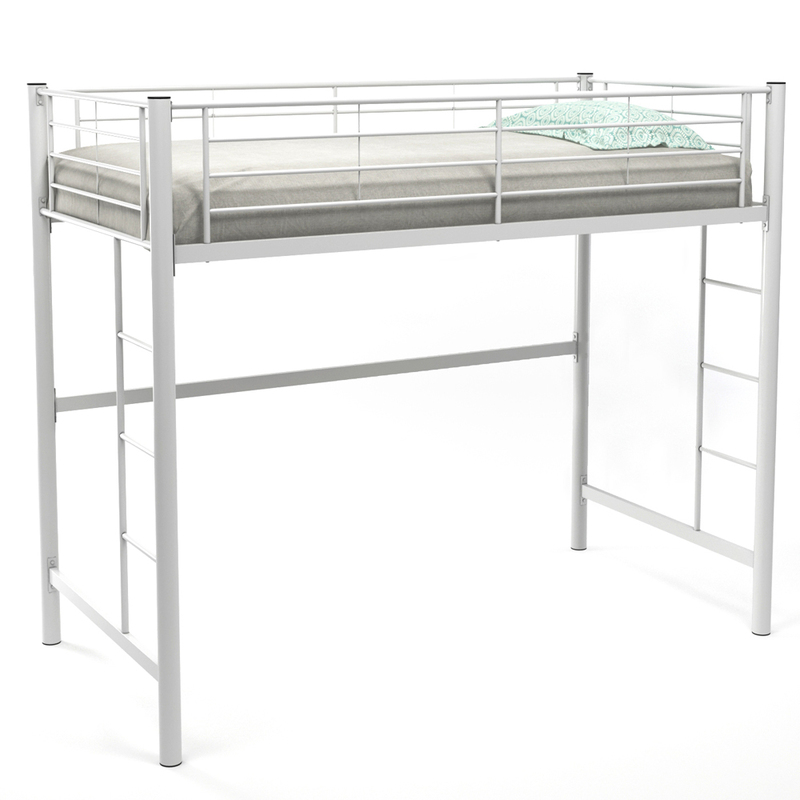 Designed with safety in mind, this bed includes full length guardrails and integrated ladders. This bed is ideal for space-saving needs with a full work table top, pull-out keyboard tray and shelving for additional storage constructed of high-grade MDF. This simple, yet contemporary white twin-over-loft bunk bed conveys chic style with clean lines and finish. A steel-crafted frame with a powder coated finish promises stability and function. 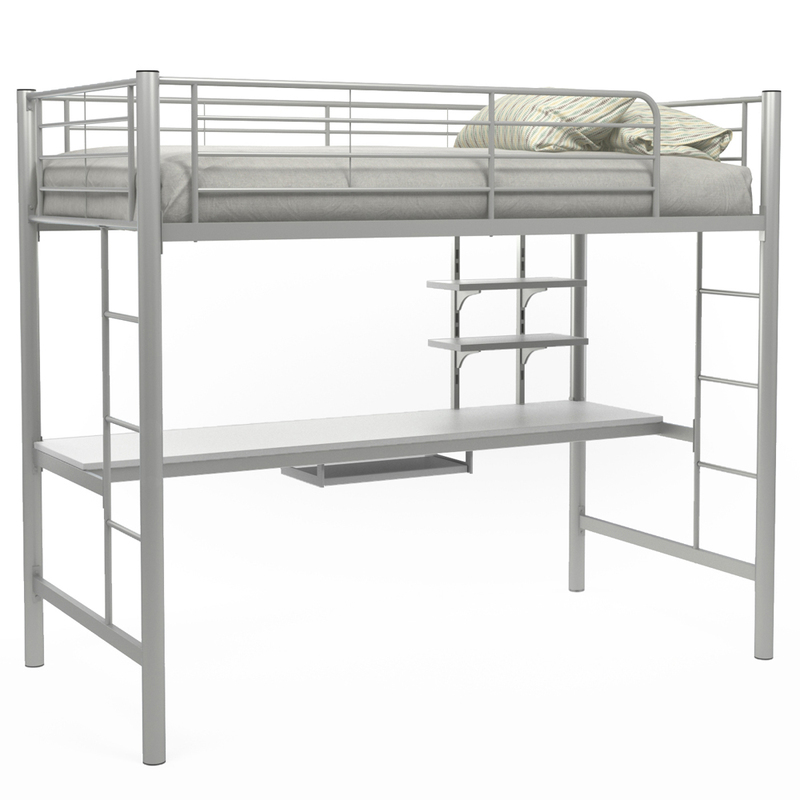 Designed with safety in mind, this bunk bed includes full length guardrails and two integrated ladders. This bed is ideal for space-saving needs and accommodates a variety of options below the loft. Bring a contemporary yet classic style to your bedroom with this chic full/double sized upholstered bed frame. The low platform and tufted headboard enveloped in soft and durable beige linen-look fabric gives it an elegant inviting appeal, while the black solid wood block legs provide sturdy support. This bed frame will be a stand out in any master bedroom refresh! A standard full size box spring is recommended. Box spring and mattress are not included. Add style, elegance and a comfortable element to your bedroom with this contemporary designed full size bed frame. Featuring a chic beige linen-look fabric with stylish antique brass metal nailhead trim and arched cutout silhouette this bed will surely be the focal point of any bedroom. The solid wood black feet give it that extra presence and durability. Recommended usage of a full size box spring. Mattress and box spring are not included. Add style, elegance and a comfortable element to your bedroom with this contemporary designed full size bed frame. 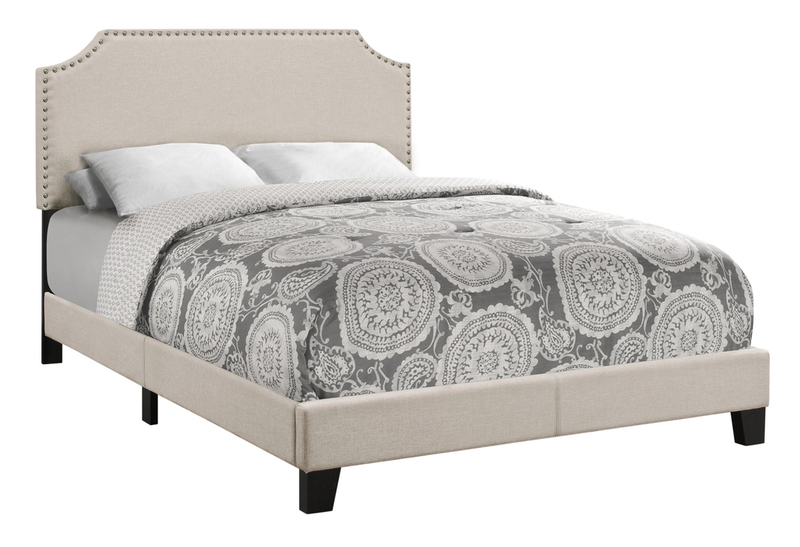 Featuring a chic beige linen fabric and stylish antique brass metal nailhead trim this bed will surely be the focal point of any bedroom.Recommended usage of full size box spring. Mattress and box spring are not included. In a beautiful transition style, this black metal full size bedframe will set the tone in a master bedroom or guestroom. The elegant open arch accents along the headboard and footboard gives a contemporary upgrade to this classic design bringing an instant makeover to any bedroom. Constructed from sturdy metal tube with strong metal slats along the base for firm mattress support and no box spring required. 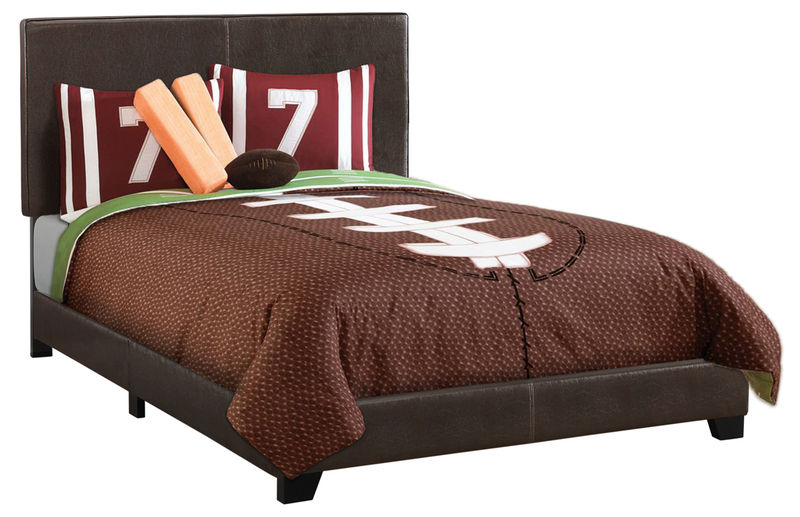 Easy to assemble, you+ll be ready for a restful sleep in your new bed in no time! Mattress is not included. 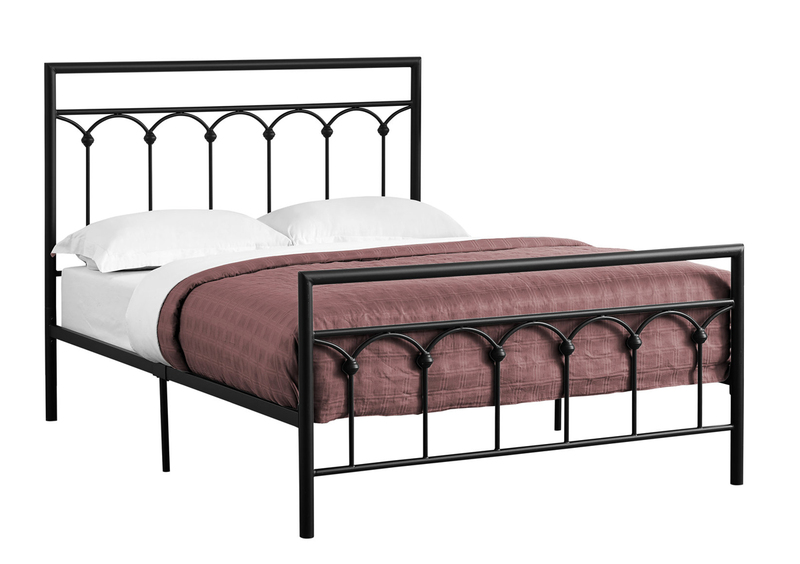 European inspired with a modern appeal, this elegant full sized black metal bed frame will be your inspiration when upgrading your bedroom dTcor. Constructed from strong metal with metal slats all along the base providing firm mattress support, this simply designed bed frame does not require a box spring. 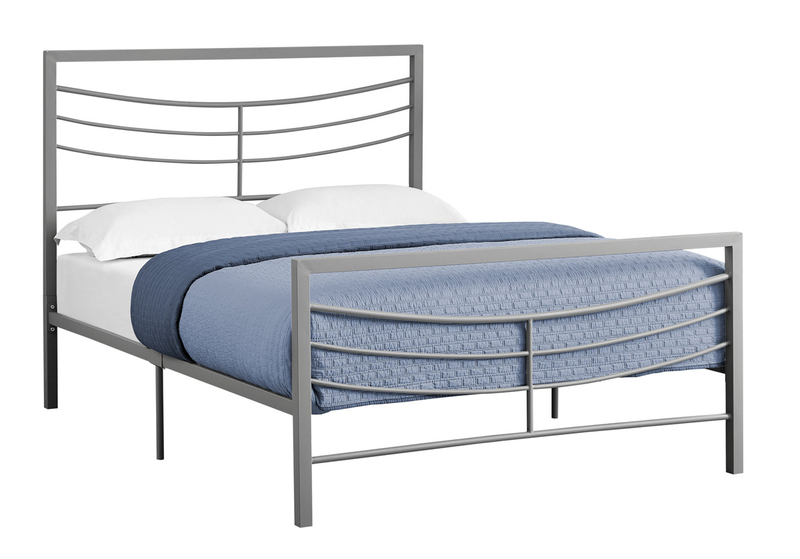 Easy to assemble and setup in no time, this beautiful contemporary metal bed will bring instant style to any bedroom. Mattress is not included. 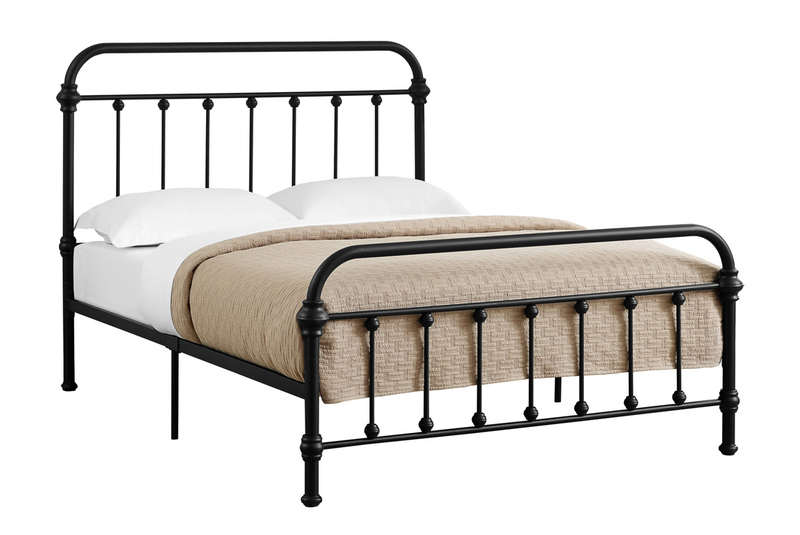 Inspired by classic vintage design, this full sized black metal bed is given a fresh update with a contemporary appeal. Constructed from sturdy metal tube with strong metal slats along the base for firm mattress support, this simply designed elegant bed frame with a rounded headboard and footboard will be a standout in any bedroom or guest room in any dTcor style. No box spring required and easy to assemble. Mattress is not included. Add style, elegance and a comfortable element to your bedroom with this contemporary designed full size bed frame. Featuring a chic brown leather-look fabric and stylish antique brass metal nailhead trim this bed will surely be the focal point of any bedroom.Recommended usage of full size box spring. Mattress and box spring are not included. 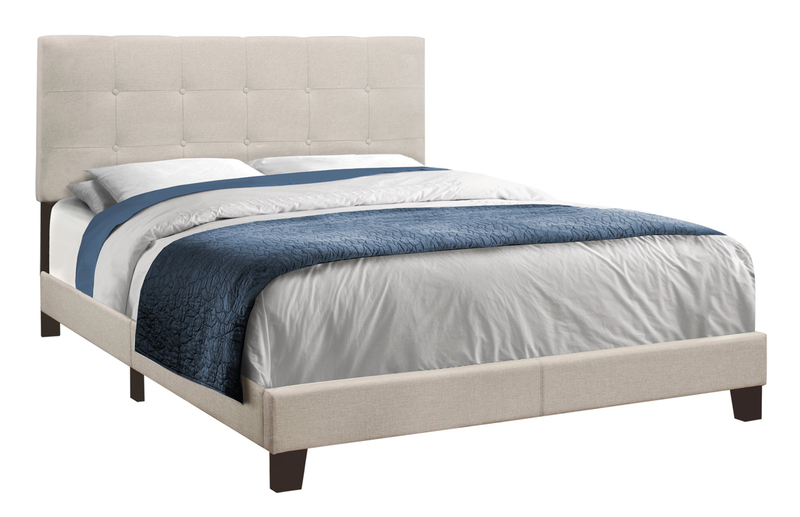 Bring a contemporary yet classic style to your bedroom with this chic full/double sized upholstered bed frame. 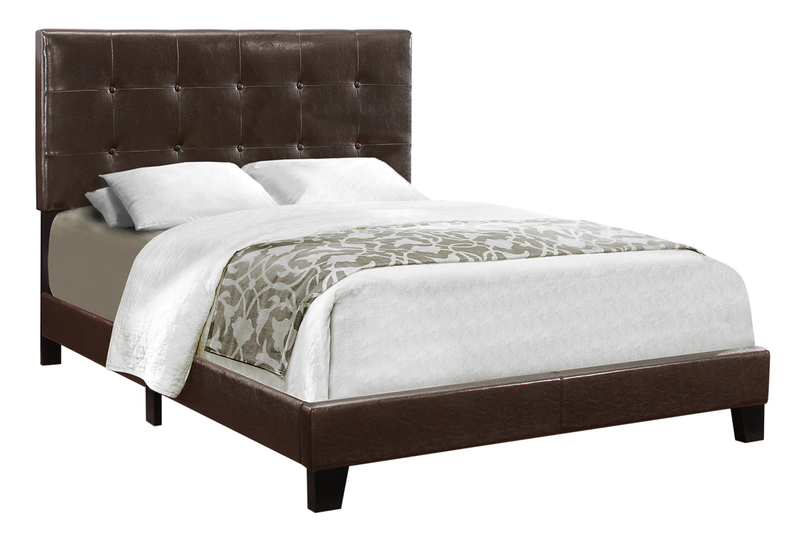 The low platform and tufted headboard enveloped in an easy to maintain and durable dark brown leather-look material gives it an elegant inviting appeal, while the black solid wood block legs provide sturdy support. This bed frame will be a stand out in any master bedroom refresh! A standard full size box spring is recommended. Box spring and mattress are not included. Add style, elegance and a comfortable element to your bedroom with this contemporary designed full size bed frame. 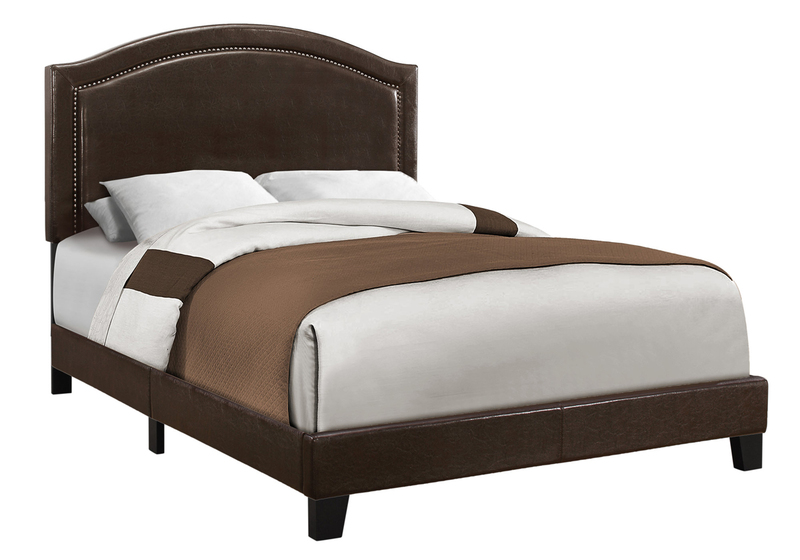 Featuring a chic brown leather-look fabric with stylish antique brass metal nailhead trim and arched cutout silhouette this bed will surely be the focal point of any bedroom. The solid wood black feet give it that extra presence and durability. Recommended usage of a full size box spring. Mattress and box spring are not included. 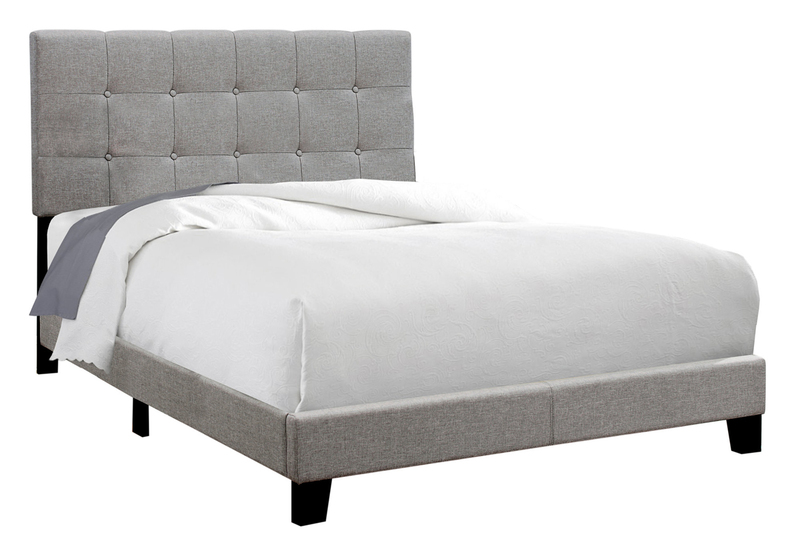 Bring a contemporary yet classic style to your bedroom with this chic full/double sized upholstered bed frame. The low platform and tufted headboard enveloped in soft and durable grey linen-look fabric gives it an elegant inviting appeal, while the black solid wood block legs provide sturdy support. This bed frame will be a stand out in any master bedroom refresh! A standard full box spring is recommended. Box spring and mattress are not included. Add style, elegance and a comfortable element to your bedroom with this contemporary designed full size bed frame. 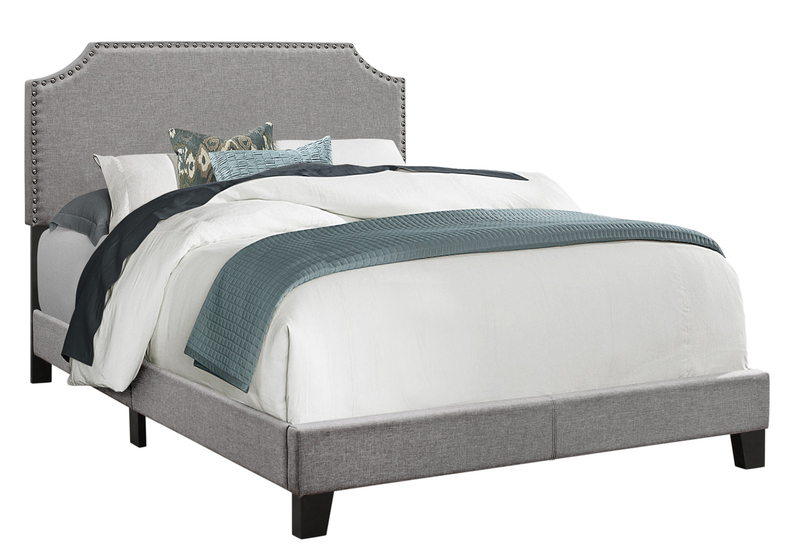 Featuring a chic grey linen fabric and stylish chrome metal nailhead trim, this bed will surely be the focal point of any bedroom. Recommended usage of full size box spring. Mattress and box spring are not included. Add style, elegance and a comfortable element to your bedroom with this contemporary designed full / double size bed frame. 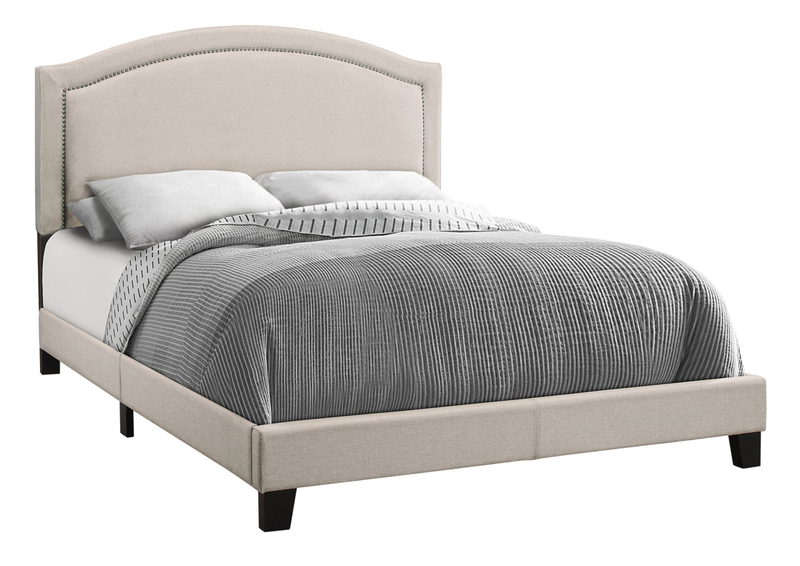 Featuring a chic grey linen-look fabric with stylish chrome metal nailhead trim and arched cutout silhouette this bed will surely be the focal point of any bedroom. The solid wood black feet give it that extra presence and durability. Recommended usage of a full size box spring. Mattress and box spring are not included. In a beautiful transition style, this silver metal full size bedframe will set the tone in a master bedroom or guestroom. The elegant open arch accents along the headboard and footboard gives a contemporary upgrade to this classic design bringing an instant makeover to any bedroom. Constructed from sturdy metal tube with strong metal slats along the base for firm mattress support and no box spring required. 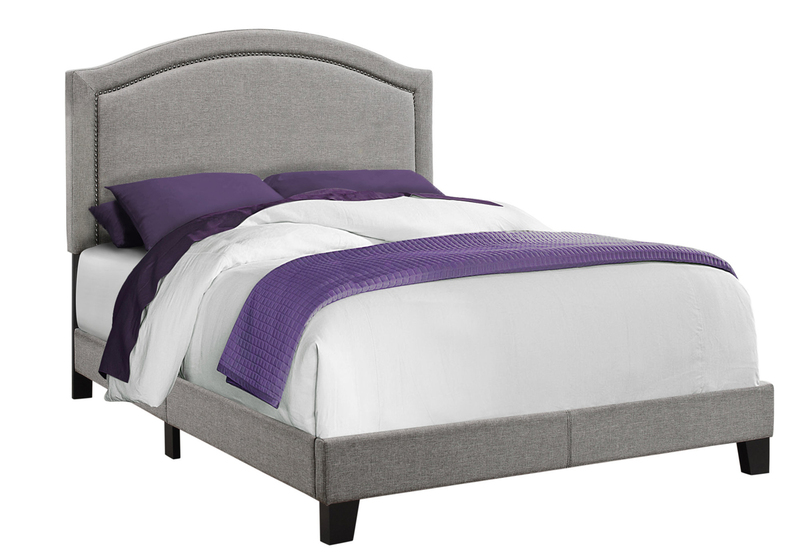 Easy to assemble, you+ll be ready for a restful sleep in your new bed in no time! Mattress is not included. 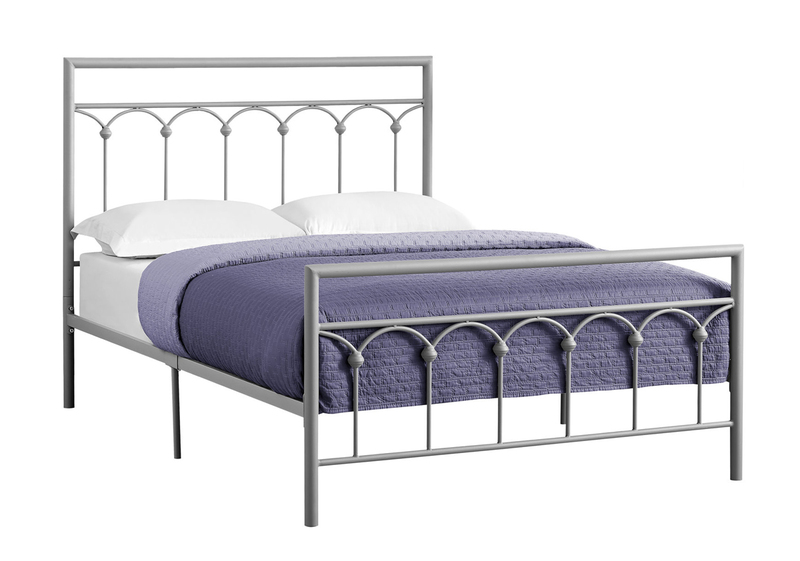 European inspired with a modern appeal, this elegant full sized silver metal bed frame will be your inspiration when upgrading your bedroom dTcor. Constructed from strong metal tubing with metal slats all along the base providing firm mattress support, this simply designed bed frame does not require a box spring. 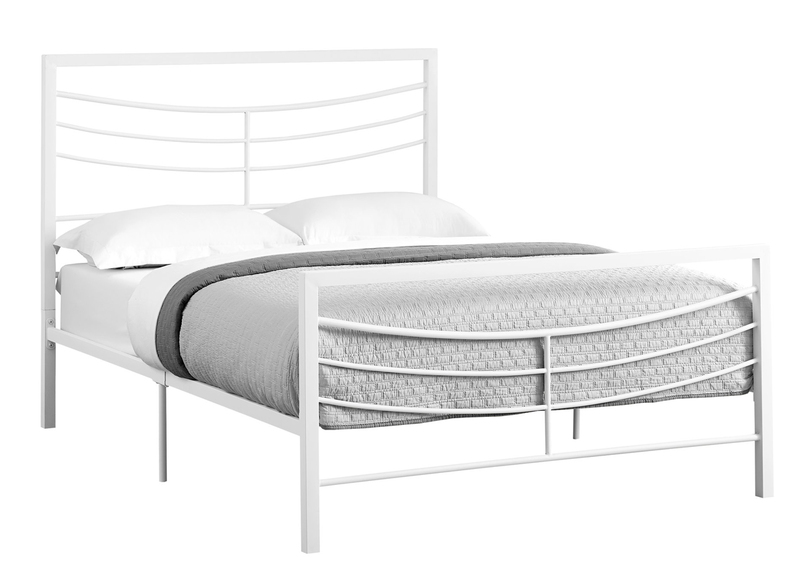 Easy to assemble and setup in no time, this beautiful contemporary metal bed will bring instant style to any bedroom. Mattress is not included. 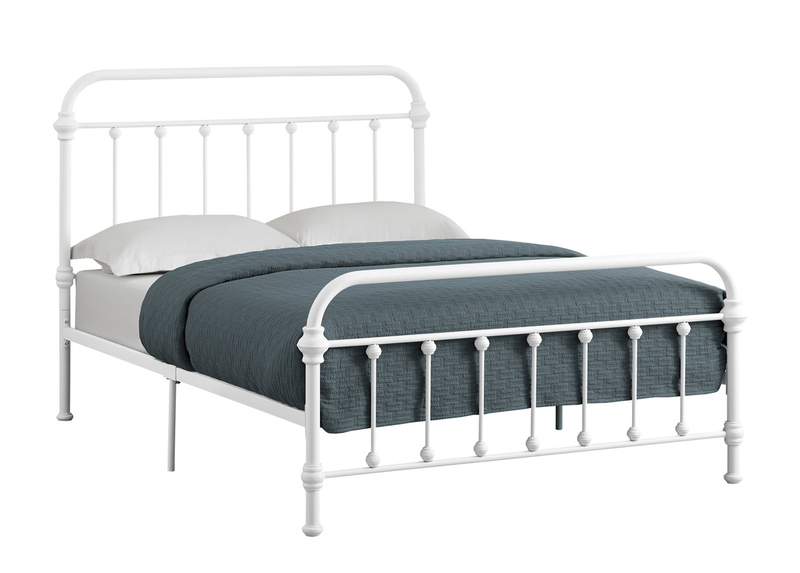 Inspired by classic vintage design, this full sized white metal bed is given a fresh update with a contemporary appeal. 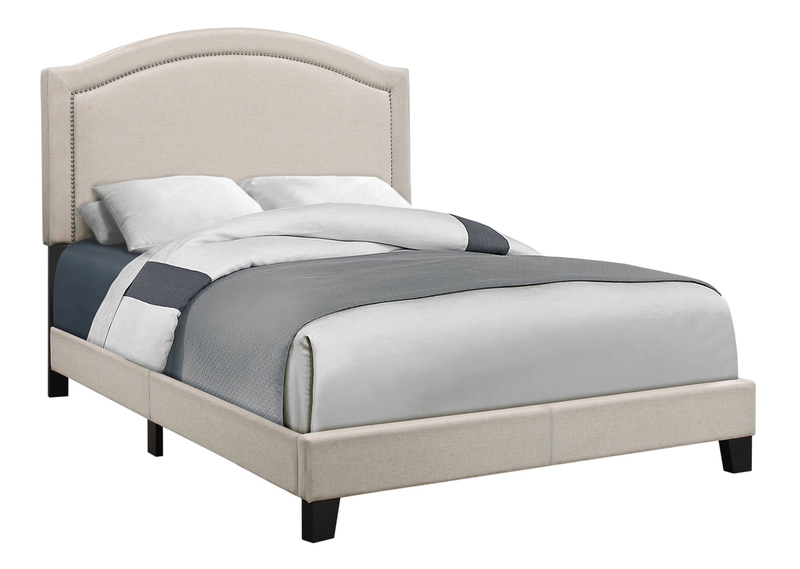 Constructed from sturdy metal tube with strong metal slats along the base for firm mattress support, this simply designed elegant bed frame with a rounded headboard and footboard will be a standout in any bedroom or guest room in any dTcor style. No box spring required and easy to assemble. Mattress is not included. European inspired with a modern appeal, this elegant full sized white metal bed frame will be your inspiration when upgrading your bedroom dTcor. Constructed from strong metal with metal slats all along the base providing firm mattress support, this simply designed bed frame does not require a box spring. 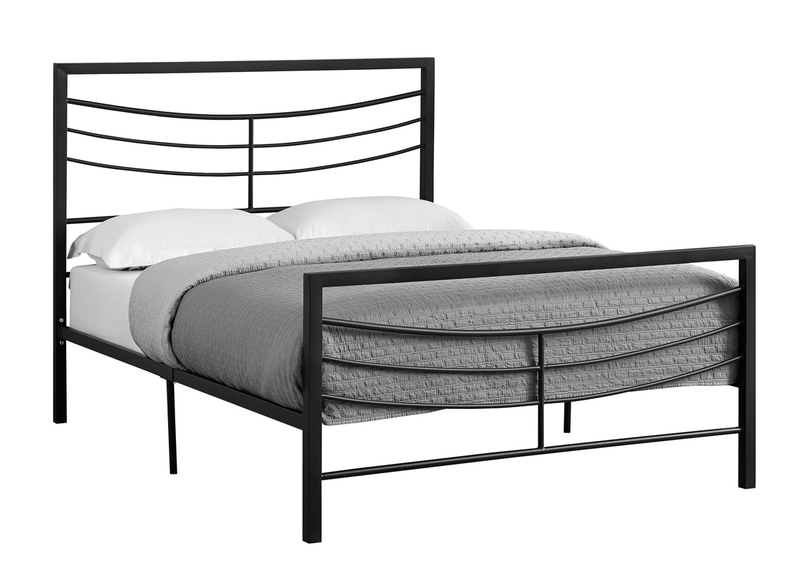 Easy to assemble and setup in no time, this beautiful contemporary metal bed will bring instant style to any bedroom. Mattress is not included. 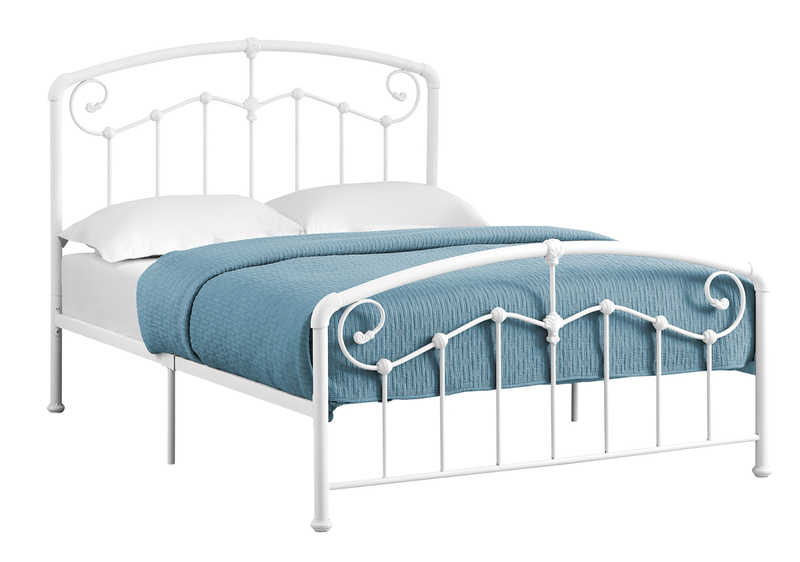 Bring a touch of elegance to a bedroom with this classic full size metal bed frame in a fresh white finish. The pretty scroll design details inside the headboard and footboard gives it that extra bit of style when walking into a bedroom. Constructed from sturdy metal tube with strong metal slats along the base for firm mattress support, makes it the perfect bed to dress up in a bedroom or guest room. Easy to assemble with no box spring required. Mattress is not included. This simple headboard/footboard will be a beautiful addition to your bedroom. It features both curved and straight lines and a flower detail that all add visual appeal and elegance to the piece. 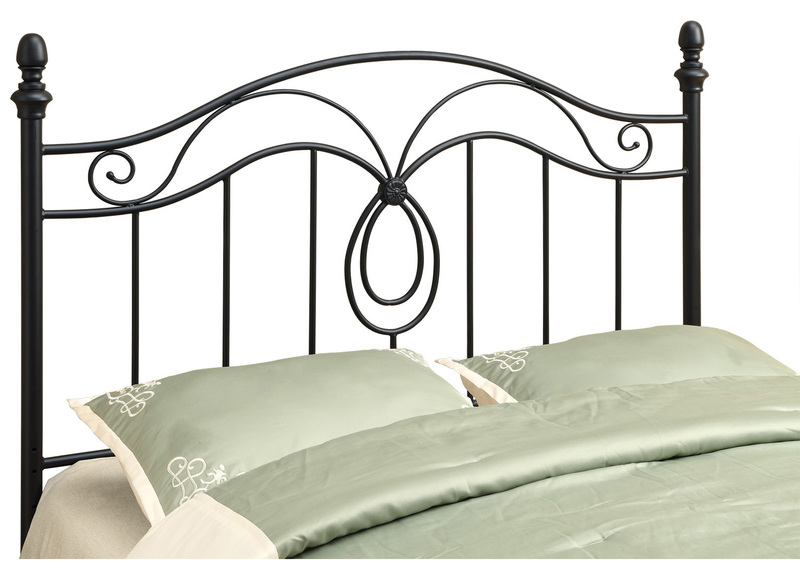 Finished in a black colored sturdy metal, this piece can accommodate a queen or full sized bed. Use as a footboard or add the extendable legs to create a headboard. This piece will no doubt help create a fresh look in any bedroom. This unique headboard/footboard will be a wonderful addition to your bedroom. It features both curved and straight lines and flower details both add visual appeal to the piece. 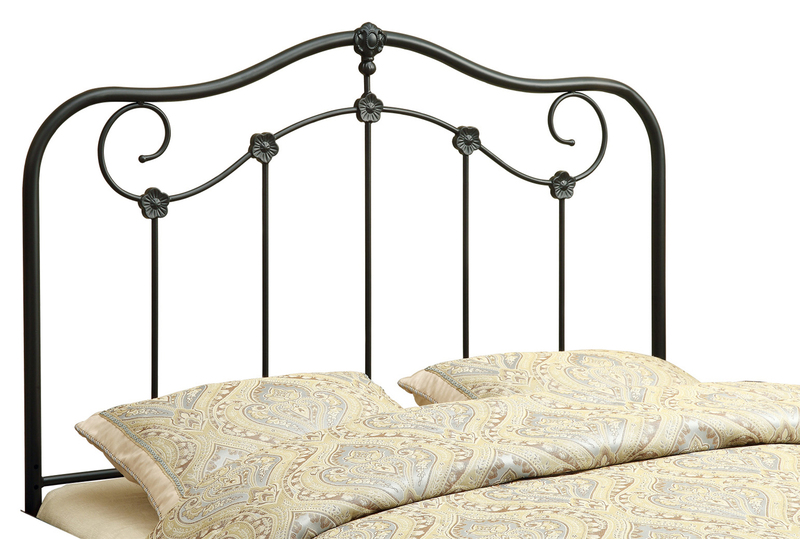 Finished in a coffee colored sturdy metal, this piece can accommodate a queen or full sized bed. Use as a footboard or add the extendable legs to create a headboard. This piece will no doubt help create a fresh look in any bedroom. 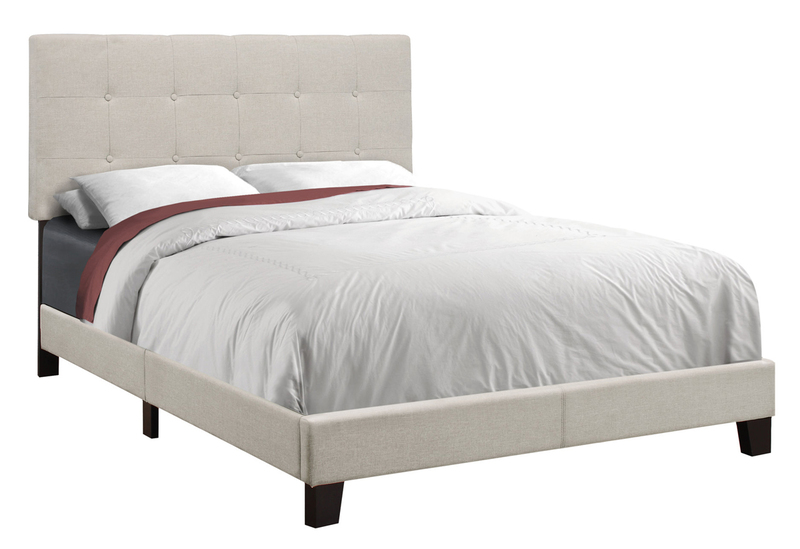 Bring a contemporary yet classic style to your bedroom with this chic queen sized upholstered bed frame. The low platform and tufted headboard enveloped in a soft and durable beige linen-look fabric gives it an elegant inviting appeal, while the black solid wood block legs provide sturdy support. This bed frame will be a stand out in any master bedroom refresh! A standard queen size box spring is recommended. Box spring and mattress are not included. Add style, elegance and a comfortable element to your bedroom with this contemporary designed queen size bed frame. Featuring a chic beige linen fabric and stylish antique brass metal nailhead trim this bed will surely be the focal point of any bedroom.Recommended usage of queen size box spring. Mattress and box spring are not included.